I have so many projects I don't know where to start! Anyone with me? Remember my brown dining room? It's on the list and here are my all over the board ideas for the direction I'm heading. Black Drama ~ Classic Charcoal ~ Warm Neutrals? Love this tone on tone stencil. Moody black walls with black cabinet. Charcoal with warm gold accents and wood. Crisp, modern pieces, white accents - would be warmed up with my farm table. Creamy neutrals, think I could find cool chairs on Craigslist? 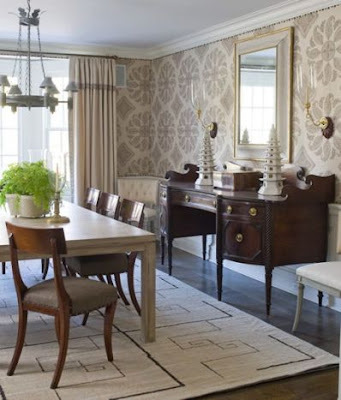 Love this large scale, yet subtle wallpaper. Opinions?? Do you have a favorite? They are all beautiful. I would think that any of them would work with the great lighting and exposure in your room. No. 4 is my fav, but I also love the dramatic. Can't wait to see your transformation. I'm really drawn to the charcoal grey images that you've pulled. And if I remember correctly that room gets a ton of natural light so could handle a dark color too. You've got some great inspiration images pulled together. I'll be curious which way you decide to go. I'm torn between the first and last photo (could I be a little more indecisive?). 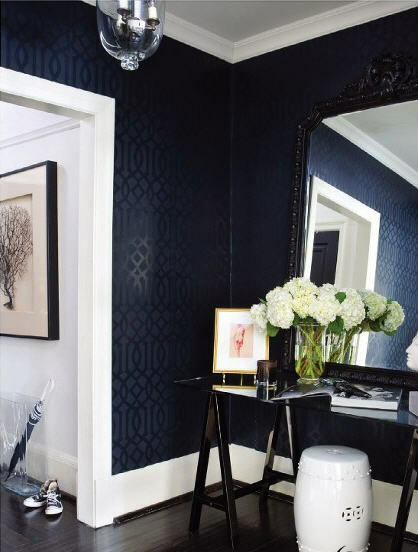 I love the drama of the dark walls with the modern tone on tone stencil against the white trim. But then I also love to cool pattern of the wallpaper and the light bright feel in the last photo. Amazing photos. They are all your style but my favorites were #1 and #3. Since your room is so light, what about if you paint the ceiling black. What do you plan on doing to add a pop of color? Art, flowers? I like the charcoal but the last images look more like you. I have a sneaky suspicion you already have something great planned in your mind! I'm positive it'll be nothing less than spectacular. They are all beautiful! I am like you though - I started by painting my dining room white, and ended up with it black. Talk about opposites. But I love it. It's getting there that is hard, but i know you'll get where you want to be even if it takes some time! I always tend to be drawn to the creamy, neutral palattes with a stunning wallpaper like the last images, but the first two photos could make me change my mind...stunning!! I like the last one - especially since the tendency these days is towards lighter colors. But, the drama is nice and stands out as a little something different. You couldn't go wrong with any of them! I think the first few are fantastic, just because they're different than the norm. If I remember right, you get plenty of light in the dining room so those darker colors would be really dramatic. I know whatever you decide, you'll make it look fabulous! I like the charcoal best. I think it would flow the best with your house and add some depth as well. You have some great selections there. I think I lean towards the charcoal with the warm accents because I think your existing pieces would great with that. Plus since you do have a lot of light in that room you could go darker. But I must say, I do love the lighter walls too. Yes, I am a big help! I can't wait to see what you decide! Maybe you will motivate me to paint my red walls! From what I've seen, I feel like inspiration from the last two images would fit well with your home. Love the creamy neutrals and I think the color palette would work well with what you have and then you can add pops of color with accessories. So excited to see what you come up with! i love the charcoal grey tones. i have to say, that's about as dark as i'd be able to go without freaking out. I really like the chairs in the 4th photo. Soft, upholstered seats and backs, with the backs slightly rounded and not as high as many similar styles. You could sit in these a long time and be very comfortable.